The market bag is coming along. I'm on Tier 6 and enjoying my first entrelac experience. If you can pick up stitches along a sock gusset, you can do entrelac. My biggest piece of advice for entrelac is to learn to knit backwards. What I mean is that instead of turning your work after only ten or twelve stitches to purl the wrong side, you learn to knit to the left needle. It's really very easy and if you're doing only a few stitches it can be a time saver. So here is how you do it (the pictures can be enlarged by clicking on them). 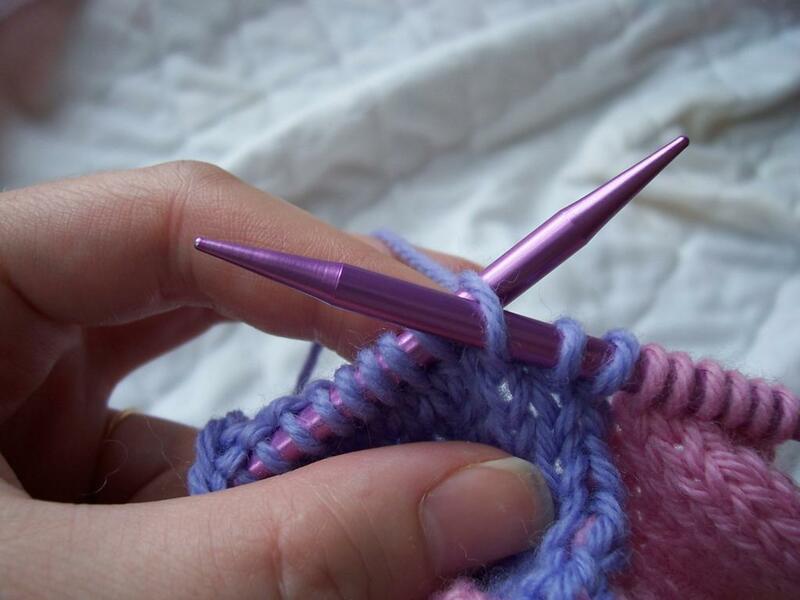 You slip the left needle into the back of the stitch on the right needle. Bring your yarn over your left needle from back to front. 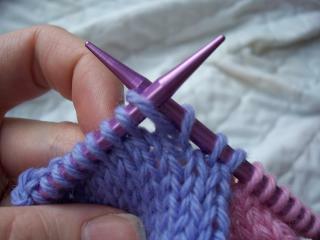 Next, bring up the yarnover through the stitch on the right needle. Finally, slip the stitch off the right needle and voila, you have a stitch done in the opposite direction (it would have been purled if you had turned the work). It does take a bit of practice, but for rows with a few stitches it is easier for me than turning the work continuously. For big projects, I still turn and purl the wrong side the traditional way. Very informative post - your pictures are really easy to follow. I taught myself to do this as well because it seems to be a handy trick to know. You're finished bag looks great too!